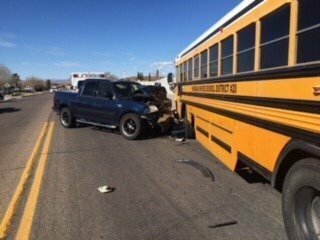 On Monday, March 26th, at 3:30pm, the Kingman Police Department investigated an injury crash involving a KUSD school bus and a Pick-up truck. The school bus, occupied by a 57 year old driver and four students, was northbound in the 1200blk of Eastern Ave., when a blue Ford pick-up, driven by a 36 year old Kingman man, driving southbound on Eastern Ave., crossed over the center line, crashing into the school bus. The collision caused the airbag in the pick-up to deploy. One student on the bus suffered minor injuries and was transported to Kingman Regional Medical Center. The driver of the truck suffered minor injuries and refused medical treatment. No other injuries were reported. The roadway was closed during the investigation for about 1 ½ hours. The investigation determined that the driver had fallen asleep due to fatigue, causing the crash. No impairment was suspected. The driver of the truck was issued a citation charging a civil violation of Failure to Control Speed to Avoid a Crash.